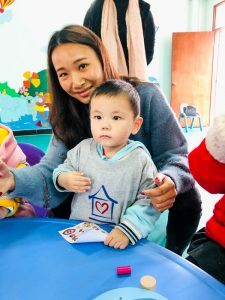 At the end of February one of our Chinese therapists, Gao Li, traveled down to southern China to visit our kids currently living in Yangxi. This was our first time visiting this facility, and it was a wonderful reunion with Corey (Song Yike), Lydia (Yangxi Zinan) and Russell James (Song Xiping), all of whom have grown so much. We sent toys for the kids and our therapy team also provided some sensory equipment for Lydia. Among other things, she received a four-pound weighted blanket. During the visit, Gao Li also provided some basic training for the orphanage staff on feeding and positioning, gate analysis, and autism and sensory stimulation. It was great to see that all the children are doing excellent, growing taller and are very well-loved by their friends, nannies and caregivers! Most recently we visited with Corey as he was at Little Flowers awaiting surgery to remove the tumor from his neck. Corey was delighted to see his SFCV ayis and to receive their special gifts brought for him, and the ayis were overjoyed to see him and lavish their love on him!